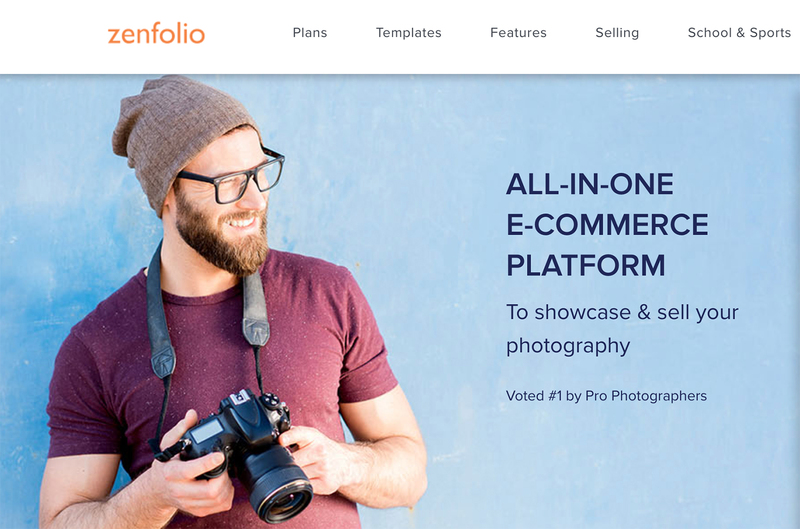 Zenfolio Review 2018 – Is This Popular Photography Web Builder Any Good? If you are someone who knows your skills very well, you should be able to design a platform that helps you showcase it easily to the world, right? If you are running a photography business or if you are a professional photographer, you need to be really good at clicking high-quality photos. But that won’t matter much if your talent is not viewed by the world. You require a website that can enable anyone to check out your work and hire you or your company’s services. But does that also mean that you need to learn coding or programming skills to get good business? There is plenty of good photography website builders available online that empower you to build top quality websites or blogs, based on photography. One such popular website builder is Zenfolio. This online portfolio site builder tool can be used to effortlessly design creative and stunning websites, without any coding knowledge. All you need to do is sign up to use this website builder and make a few clicks and drag-and-drops to creatively build a photography website. To understand how to store your entire portfolio of amazing photographs and share them with the world, let’s take a closer look at the features of Zenfolio. In this article, we provide in-depth information about the customer support offered by Zenfolio, its history, template designs, pricing plans and various other features. Our aim is to help you decide whether Zenfolio is the right tool that can enhance your brand value as a photography business or a photographer. This all-in-one photography platform to help photographers (amateurs and professionals) organise, showcase and sell their photographs to the world was the brainchild of four friends. The Zenfolio headquarters are situated in Menlo Park, California and Arnaud is the General Manager of Zenfolio. It is a small part of the Art.com Inc. family of brands with the collective aim of making art accessible to everyone. Over a period of time, Zenfolio has proved to be much more than just a photo hosting website service, as it even helps you connect with other highly skilled photographers and improve your professional network. It has managed to hold its own against stiff competition from other portfolio website builders, such as Carbonmade, PhotoShelter and Squarespace. You get solid support from the Zenfolio team for 365 days a year. You can submit your queries or requests for information on the Zenfolio Contact Us page. For any of your email queries, you can expect to receive responses within four hours. However, before submitting your queries, you can check if the answers are already available at the Zenfolio support centre. You also have access to several online training videos, user forums and more. It is important that avoid contacting their customer support team for queries related to individual photographers or galleries related to them. You are provided with the contact details of the photographer, whom you can contact directly for any such queries. Zenfolio provides you with a wide range of professionally designed layouts and themes. The theme designer allows you to have a lot of control over your site’s graphical elements to customise backgrounds, buttons, text and more. You also have access to plenty of well-designed themes that are stylishly different from each other. You can build your website using any of these themes as your base and try different customisations to get what you want. However, you may find that most of the themes have a pretty similar structure. This website builder has built-in custom pages which are available in multiple languages, such as English, French and German. These allow you to have a website with the unique content of your choice. You can also get the standard pages for Contact Us, About Us, Pricing of photographs and so on as well as custom pages for attractive testimonials from clients. You use the WYSIWYG text editor to write text or embed videos and photos. At times, the customisation options are limited for the built-in pages. This is evident when you cannot remove or add fields to the contact form using the tool. You can perform the editing of pages at different stages, for example by using the built-in page editor to organise the pages, while using the layout editor or organiser to modify the page. If you prefer to have all these page editing features in one place, then you may not like the distributed functionalities on offer. You can use this tool to create beautiful galleries of your photographs so that your clients would want to work with you. They can be designed to ensure the images and videos are loaded quickly and seamlessly at run-time, irrespective of the screen display size. The professionally crafted layouts from Zenfolio ensure that you can leave a long-lasting impression on your clients with a creative presentation of your photography work. Once your galleries are ready to be viewed, you can send email invitations to your family, friends and clients. You can have your own domain name point towards the website that you have made with Zenfolio. So, there is no Zenfolio branding and you can have your customised domain name as the identity for your professional website. You even get a fully integrated cart for specific subscription plans that allow you to sell plenty of your image products. Your website is further enhanced for SEO with a fully integrated photo blog that allows you to share your latest photos, image slideshows and video clips with all your clients through a direct link with the client galleries. For better SEO, the sitemap of your website is also automatically submitted to all major search engines. Additionally, the content fields that get indexed by search engines, like Google and Bing, are clearly indicated. You can use Zenfolio for free for a 14-day trial period and you don’t even have to enter your credit card details to be eligible for this. During these two weeks, you can use all the features offered by the tool, take a look at all the templates and check out various customising possibilities. Once you are satisfied with the results from Zenfolio, you can decide to opt for any of the various paid plans on offer. You can sign up for the Zenfolio free trial anytime. All the plans offered by Zenfolio comprise a customisable website and blog, HD video hosting, unlimited storage for photos and access controls with passwords. The three subscription plans for Zenfolio are listed below. It allows you to get in touch with a whole network of photographers with its photographer central, which is a comprehensive directory of professional photographers across multiple genres. Your photographs also get listed on the photographer central at a discounted price or for free, depending on your subscription plan. They can then be seen by prospective clients. This makes it easy for you to build new clients, who can contact you immediately if they like your work. Zenfolio gives you the freedom to add music to your image slideshows and thus gives your photo-viewers a pleasant experience. Your website is automatically optimised for mobile phones and tablets. Also, you get access to plenty of free applications for iPhone, Android and Blackberry that help you manage your photos easily. Zenfolio enables you to work with different custom and built-in pages. So, you can clearly address your requirements for unique customised webpages on your site as well as for standard pages like a guest book; contact us, blog and so on. Your website is created with HTML, even though you do not have to do any coding. Thus, with no Flash used, your site is optimised for search engines and is more likely to appear high in search engine results when a user makes an online search for professional photography services. The WYSIWYG text editor that accompanies the custom pages may be unable to handle complex elements, such as maps, forms and columns. The user interface of Zenfolio is stuffed with a lot of options. This makes it difficult at times for a new user to understand or search for specific links and features. So, the navigation part is not very user-friendly. They do not have a telephone number where you can call to get quick customer support for your issues or queries when designing your website. Also, the live chat support is only available with one of the three subscription plans. You don’t have access to any web fonts and can only use the 12 system fonts. So, you may not be able to style your text fonts in several different ways. The above review of the Zenfolio photo website builder is our honest take on the benefits you get while using this tool and the problems you are likely to face. It is a good option, especially if you are a newbie photographer or photography blogger who wants to start off with a basic subscription plan that doesn’t cost a lot. However, due to certain limitations in terms of the complex user interface and lack of high levels of customisation for pages, you may not prefer this tool as a photography business. Again, a lot depends on the nature and purpose of your use. We hope that the above information helps you make a decision about whether Zenfolio is an appropriate website builder for your photography-based website requirements! Do you have any questions for us? Please feel free to leave your comments below and thanks for reading!